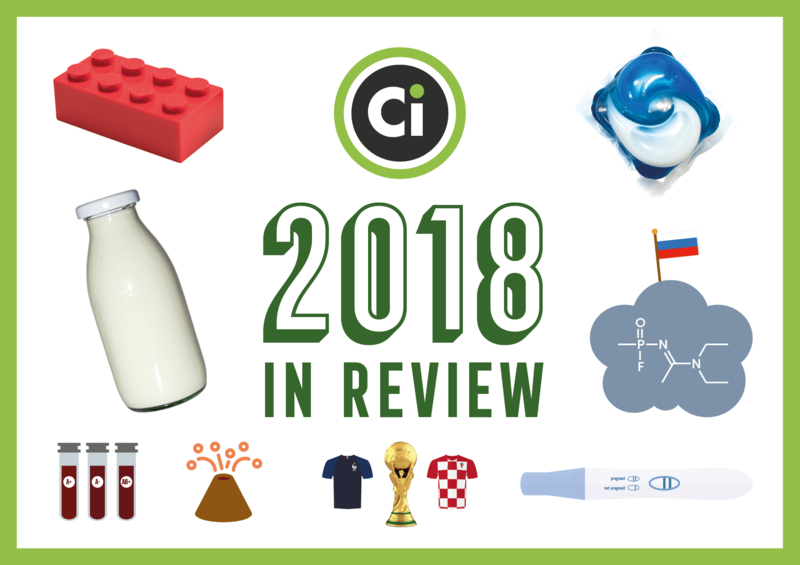 As we head into 2018, it’s time to take a look back at some of the biggest chemistry news stories over the past year. 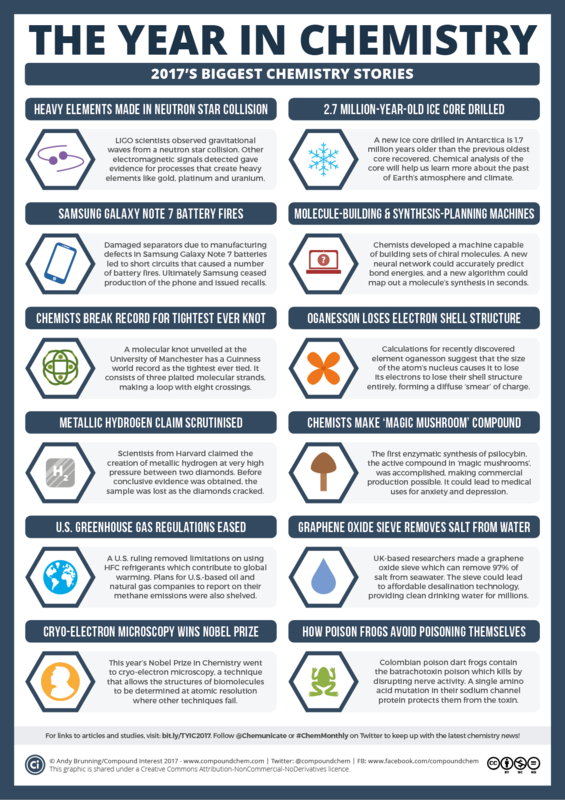 This year’s chemistry news featured poisonous frogs, battery fires, element creation, and more! 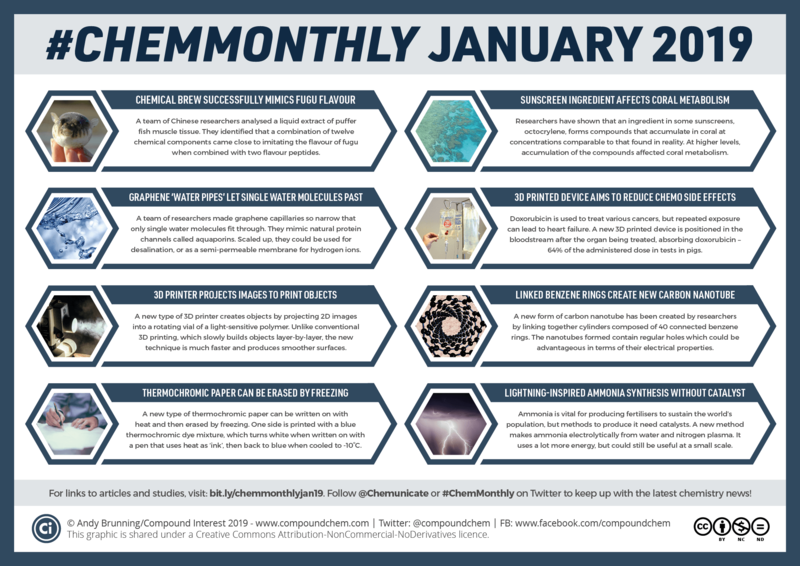 2017 saw a number of firsts, including the first enzymatic synthesis of the active compound in ‘magic mushrooms’, and a scrutinised claim for the first creation of metallic hydrogen. Boundaries were also pushed: chemists from the University of Manchester scored a Guinness world record for creating the world’s tightest (molecular) knot, and an ice core 1.7 million years older than the previous oldest core recovered could tell us more about the history of Earth’s atmosphere and climate. There was also cause for concern in some areas. The easing of regulations relating to greenhouse gases including hydrofluorocarbons and methane in the United States, coupled with the Trump administration’s decision to withdraw from the Paris Climate Agreement, stoked worries about the world’s ability to effectively combat climate change. 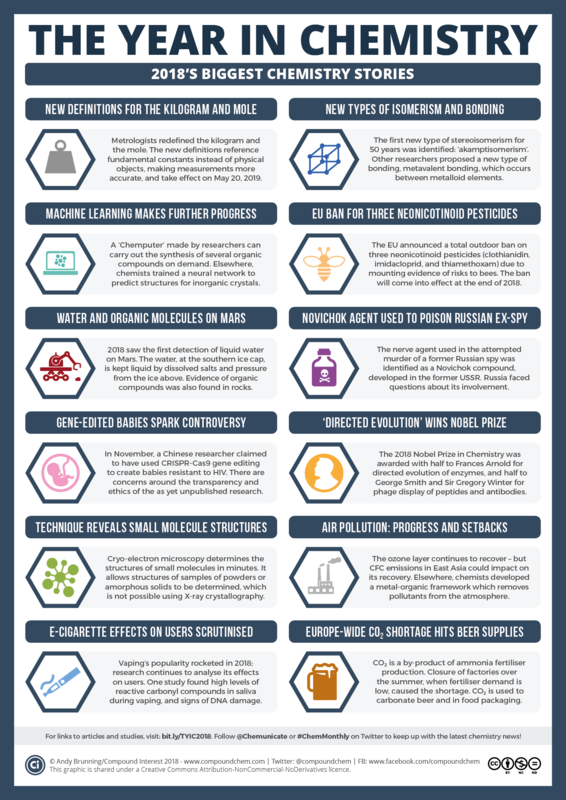 Artificial intelligence has been progressing rapidly, and this was also true in chemistry in 2017. An algorithm which could map out a molecule’s synthesis more effectively than human chemists was one such example. A network that could accurately predict bond energies and a machine capable of building sets of chiral molecules were other technological highlights. The list of stories here is largely subjective of course; do feel free to comment below if you think I’ve missed anything important, or if there are simply other stories worthy of highlighting. You can click on the graphic above to enlarge it and make it easier to read, but I’ve also posted each individual story in its own image below. I’ve also included the links to both articles and original studies (where relevant) for the stories featured, so if you wanted to read up on any of them in more detail you can! 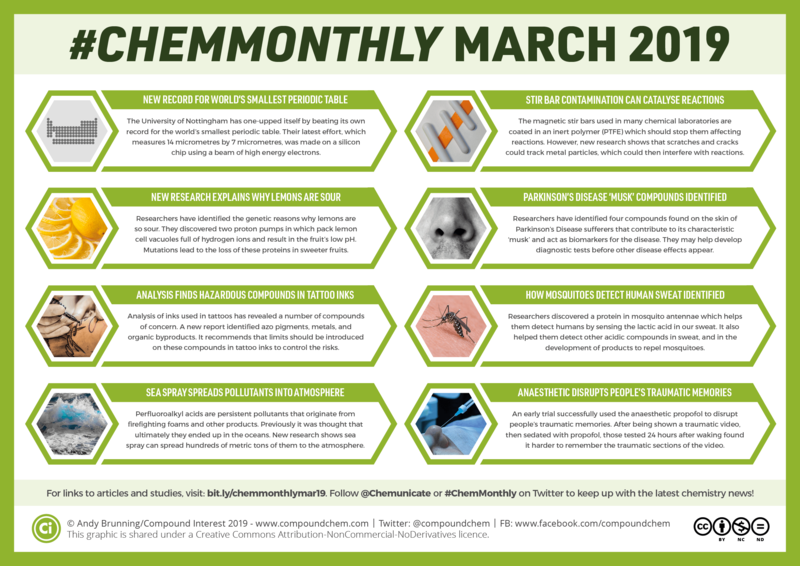 Keep track of #ChemMonthly posts on the category page. 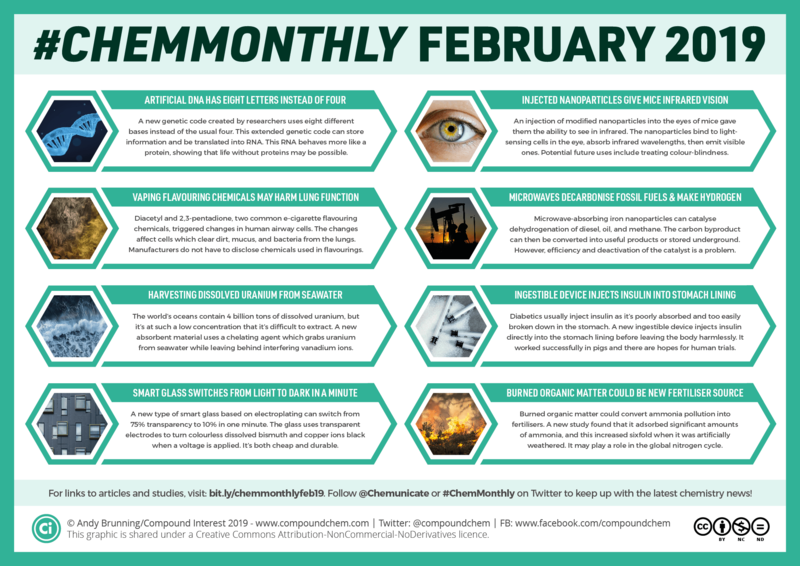 You can also keep up with stories through the month via the @Chemunicate account or the #ChemMonthly hashtag on Twitter. Enjoy Compound Interest’s posts? Consider supporting Compound Interest on Patreon!